I cannot figure out why we call some cities by their native name and others by the English/American version. For instance, Rome vs Roma, Florence vs Firenze, Munich vs Munchen. I have decided not to contemplate this too much because I am on vacation, but I will say it is much more fun to say Roma, Munchen and Firenze. Speaking of Firenze, that was our destination today. Florence had the hustle and bustle going from the minute we turned onto its streets. Cars stacked up at intersections and motorcycles darted in between them in spaces thinner than a pepperoni. It was unnerving but totally worth every nail that was bitten off during the drive. Seeing the Statue of David by Michelangelo would be reason enough to go to this city. He was magnificent. At 17 feet tall, he literally was head and shoulders above all the other statues in the corridor. He was not the only attraction in his area, though surely he was the main attraction. Michelangelo also had a hall lined with his Statuas Incompiuta (Unfinished Statues). According to Michelangelo, the figures were already in the stone just waiting to emerge as he sculpted. They were fascinating. And, of course, there is a duomo in Florence. 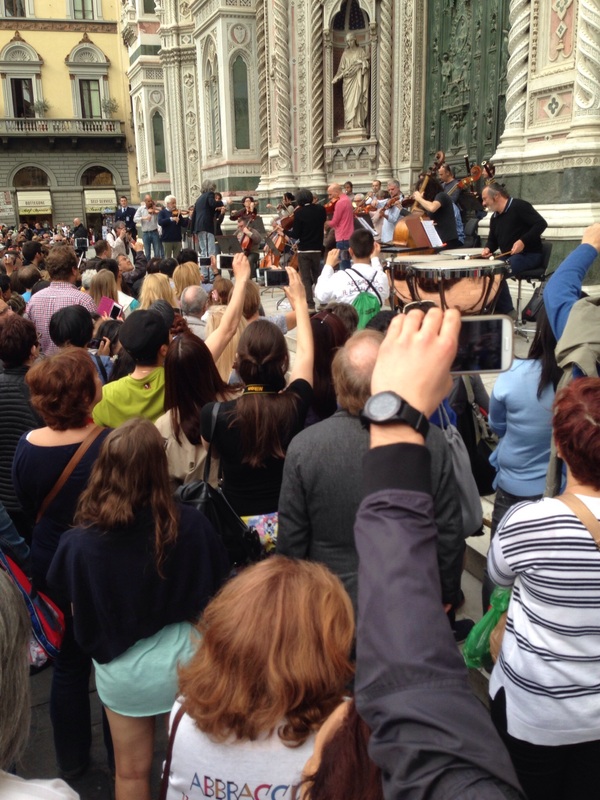 As we left the city an orchestra had assembled on the front steps of the cathedral and gave a small concert. They appeared one by one as musicians playing solo and then they came together with a sound so magnificent that it brought tears to my eyes. As we headed down the autostrada toward our resort, an hour and a half away, we decided we would take a different route home. We exited at Chiusi to look for dinner in this small town or any of the others that dot the meandering roads on our way back. It was not looking too promising to find anything. The landscape was becoming more and more rural. Our plan was to follow the signs for the first eatery of any kind that we came across. Since there was nobody else on the road, when we noticed a small sign Bob screeched to a stop and we turned up the unpaved road. 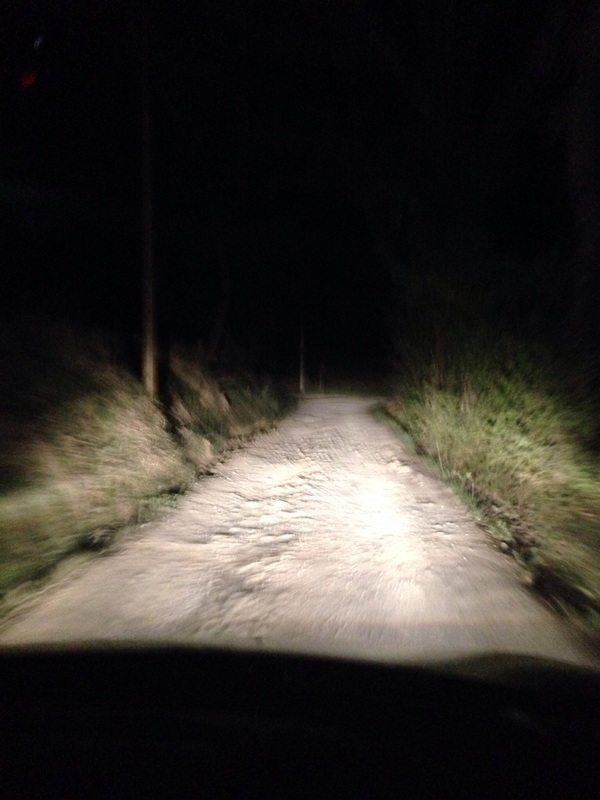 This was what they refer to here as a white road – gravel and narrow. At the end of this road we found a charming little restaurant, Trattoria del Contadino, and had the best meal of our trip. We were the only guests and were treated like VIPs – from the antipasto tray all the way to the limoncello at the end of our meal. It was perfecto. Unfortunately we lingered long enough that Bob had to drive the white road out of there. We were thankful to be back in our beds that night. The views at night are a bit more terrifying.